Agile practices and techniques, such as continuous delivery, are about being able to react to changes rapidly. However, putting them into practice when you have a big monolith application can be difficult. A microservice architecture offers one solution. Breaking the monolith and moving toward a microservice architecture can offer significant advantages to organizations, in terms of improving team autonomy and increasing frequency of change. These benefits, however, come at a cost. Teams are not always aware of the additional complexity associated with distributed systems and the level of maturity and investment that organizations require to succeed with them. 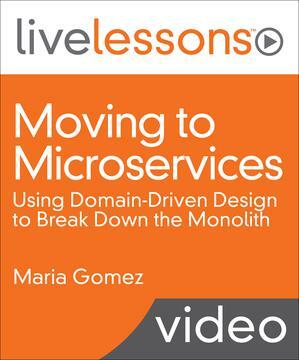 In Moving to Microservices LiveLessons, Maria Gomez, a lead consultant at Thoughtworks, introduces considerations and best practices for moving to microservices. Gomez first defines the prerequisites for moving into a microservice architecture. She helps you understand the relative cost of the changes involved so that you can decide whether they are worth it for your organization. With step-by-step examples using domain-driven design (DDD) and other extreme programming (XP) techniques, she then demonstrates how to break down your existing monolith into independent, cooperating entities. Maria Gomez is a tech lead and lead consultant at ThoughtWorks. With more than eight years of industry experience, Maria has worked with many different technologies and domains, which has helped her lead teams and advise stakeholders in making the right technology decisions. She has talked about architecture at various conferences in the United States and South America. Exercises are in Java-prior knowledge is not required but may be beneficial.